I recently celebrated a birthday, which is always exciting to reach the finish line of one trip around the sun and launch into another. This year, the first birthday card I received was from my chiropractor. A not so subtle reminder that as my twenties grow farther away in the review mirror, so does my ability to bounce back from injuries, periods of inactivity, and illness. As we age our muscles atrophy faster, meaning we have to actually work to keep them around (uggg!) However, our muscles can truly be our best friends as we age, especially as caregivers and individuals with Alzheimer's or dementia. By maintaining our core strength, we have improved balance, meaning less chance of falls; we can carry out our daily activities with greater ease; and even bounce back from illness. Not to mention the stress relief that comes a long with a little exercise. For individuals with Alzheimer's disease or dementia, light exercise has been shown to decrease anxiety and stress including easing the anxiety related to sundowning. 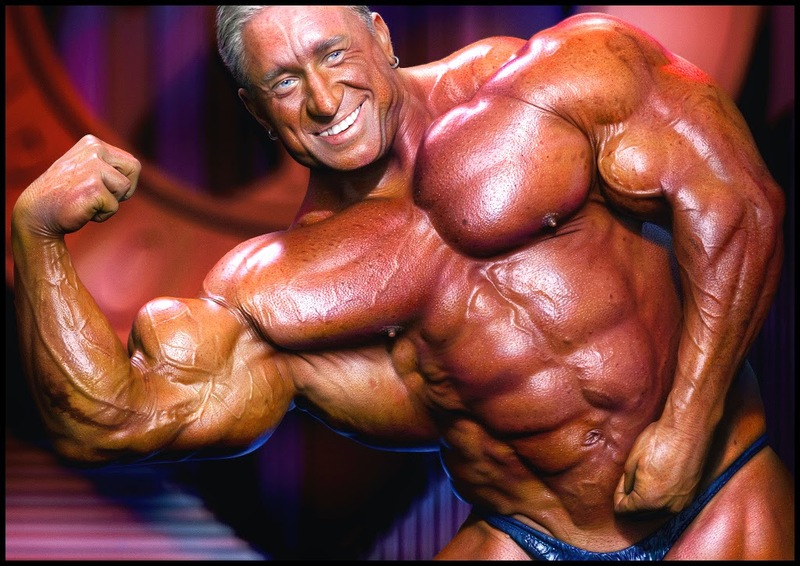 Now I am not talking about becoming a body builder, or even daily trips to the gym. (I actually just cancelled my membership!) The best part about thinking about our muscles is it is never too late to start and exercise happens everywhere, everyday! From chair exercises to things we do around the house, like vacuuming and gardening, you can turn any activity into muscle building. As a matter of fact, as I am typing I am flexing my foot up and down to strengthen the muscles on the front of my leg to prevent shin splints. Need a place to start? There are tons of resources out there, but here are a few really great ones! When it comes to our bodies, if you don't use it, you lose it! Thank you to everyone who made the inaugural Alzheimer's & Brain Awareness Month a success! 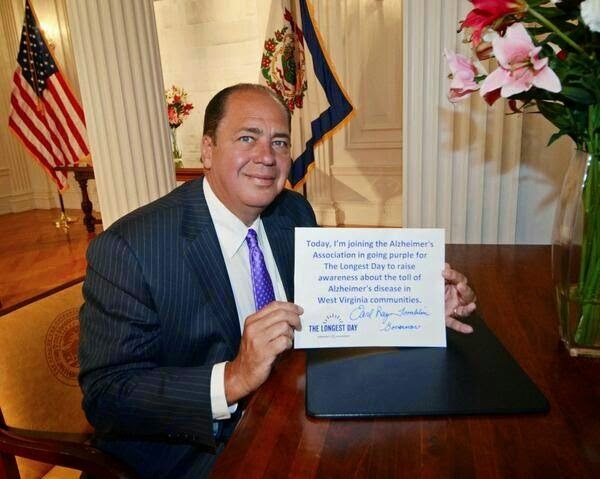 We even were tweeted by the Governor! I loved seeing all of the Go Purple and Longest Day activities. By educated our communities, we can achieve our vision of a world without Alzheimer's. The count down to Walk to End Alzheimer's has begun! Have you registered your team yet? We have a number of community workshops and Walk events scheduled throughout the summer, be sure to stay tuned to our community calendar for all the latest! Have you recently been diagnosed with Alzheimer's or know someone who has? Our early stage programs are for you and your caregiver. Find out more information and an event near you by clicking here. Summer is the best, fresh fruit and vegetables seem to be everywhere you turn. I love an easy cobbler, and when you make it in individual servings it seems just that much easier. 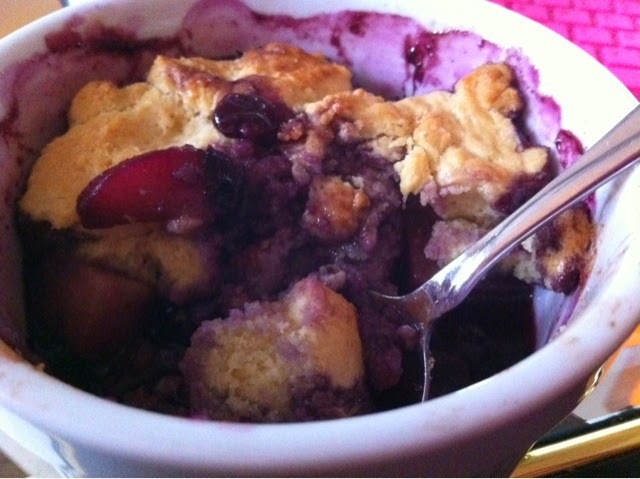 The great thing about this recipe is that the blueberries and pear can be substituted for just about any other kind of fruit. Pre-heat the oven to 350. Peel and cut two large pears, mix with 1 cup of blueberries, 1/4 cup of sugar, 1/2 tsp of cinnamon, pinch of nutmeg, pinch of salt and a squeeze of lemon. In a separate bowl, mix together 1 cup of flower, 1 tsp. baking powder, 1/2 cup of butter (chilled), and a pinch of sugar. Feel free to add in almond extract or almond paste! 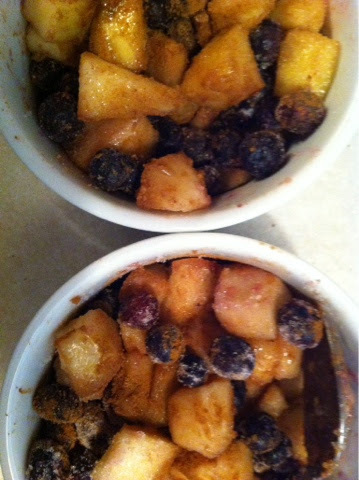 Divide the pears/berry mix between your individual sized ramekins, then top with the flour/butter mixture. Bake for 20-30 minutes or until the top is golden brown! Serve with ice cream or homemade whip cream!